I realized something again today…many times I love my sin. What bothers me is that I’m not supposed to love my sin, after all I have been a Christian for a long time. Shouldn’t I hate sin and rail against it. Aren’t I suppose to flee from evil, just like Joseph ran away naked from Potiphar’s wife? I suppose to hate what is evil and cling to what is good, right? Why is sin such a prevalent part of my life? And more than that why do I love it, coddle it, make excuses for it, and embrace it as if I would die without it? Because I am by nature a sinner? Wait you might say doesn’t the Bible say that when we become a Christian the old things have gone and the new has come? And why did Paul say that the things he wants to do he doesn’t do, but the sinful things he doesn’t want to do, he still does? Why did he still struggle? I understand the duality of our nature. I understand that our spirit was brought to life but sin still holds sway, but that doesn’t make me feel any better. So, my prayer today for myself is that God would help me to WANT TO hate my sin, because most days I don’t. Thank God for Jesus….He has and is and will be the One who makes up for my sins, weaknesses, and failures through His cross and by His Grace. Who Is This Right Wing Christian, Republican, Tea Party God? I appreciate your honesty here, Mark. This definitely resonates with me, and God used this to encourage my heart that it’s not just me who feels this way. Keep trusting in Him, and He will be there for you. I’ll keep you in prayer about this. Thanks Mark, this really resonates with me as well. Oh to hate sin more than I do and to love God more than I do. I fail continually on both fronts; thank God His grace is greater than my sin. This post hits on one of the areas I celebrate about the Wesleyan I am. While we have been justified by God’s grace, we are all on the journey of sanctification. Some day, we will reach perfection in love by God’s sanctifying grace but that is not today. So today I experience God’s grace, learn to love God more and hate my sin a little more. But I must always stay open to the moving of the Holy Spirit. We are all in journey. 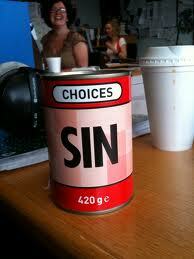 Sin is the comfort-food of the flesh. It so much easier to succumb to anger than it is to unconditional love becuse we feel justified in that anger. It takes real work not to give in pride when one knows that one is right. It takes effort of heroic proportions not to engage in the process of setting others straight, pointing out their failings or highlighting what we think are our own successes. Hating sin. I am careful not to make a list of sins because I know, first of all, that I’m probably going to leave my favorite ones off the list. Secondly, the list is dangerous because what for me is a sin might be something silly to another person. For me a glass of wine with a meal, for example, is nothing but to someone prone to alcholic behavior or someone who has no tolerace for alchohol, it may be egregious. The bible encourages us to confiss our sins and promises that God will cleanse us from all unrighteousness. It does get tedious confessing the same things over and over again and I think that eventually, we’ll get to the point when committing it won’t be worth going through the confession. I used to smoke. I don’t smoke now and rarey do I think, “Boy, I’d like to have a puff.” That wasn’t always the case and when it does come up, it seems silly in comparrison with what I had to go through to rid myself of addiction.